FIFA have unveiled the official mascot for the upcoming 2018 World Cup in Russia. 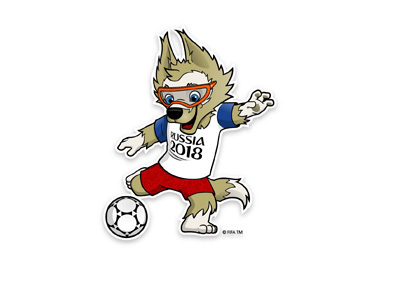 It's name is Zabivaka and it is a fun loving, goal scoring, shades wearing wolf. In translation from Russian, Zabivaka means the goal-scorer. As it usually is the case with large global sporting events, the mascot choosing process was a public vote in which the wolf beat out a space tiger and a cat with 53% of the votes. The name of the student designer who created Zabivaka is Ekaterina Bocharova. The World Cup in Russia gets underway on June 14th, 2018. The final will be played on July 15th at the Luzhniki Stadium in Moscow.